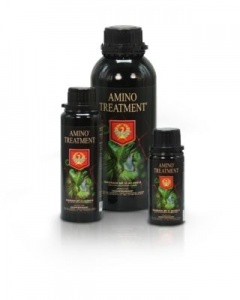 House & Garden Amino Treatment contains amino acids and other powerful ingredients to encourage vigorous root development, vegetative growth and fruit/flower production. How to Use : Use on rooted cuttings and plants in the vegetative stage right up until 3 weeks before harvest. Make up your nutrient solution/feed as usual and add any other boosters. Adjust pH if necessary and THEN add Amino Treatment at a rate of 0.2 – 1.0ml/Litre depending on plant size and growth stage. For hand-watered plants, use a moderate dose every watering.